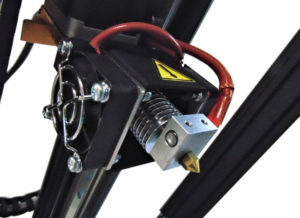 Sliding 3D Plus is suitable for printing in addition to the usual materials also technologically advanced materials that are extruded at high temperatures, as it uses the new extruder block equipped with a Type K – Class I – thermocouple mounted in the new heating block that allows the nozzle to reach temperatures up to 480 °C. 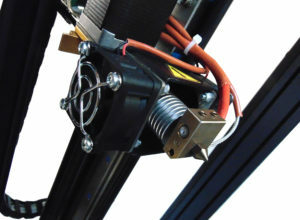 In the Sliding 3D Plus version the extruder cooling system was upgraded and the quick nozzle change system was adopted. Furthermore, in the Plus version the belt is made with new materials that can withstand temperatures on the heated bed up to over 130 °C.